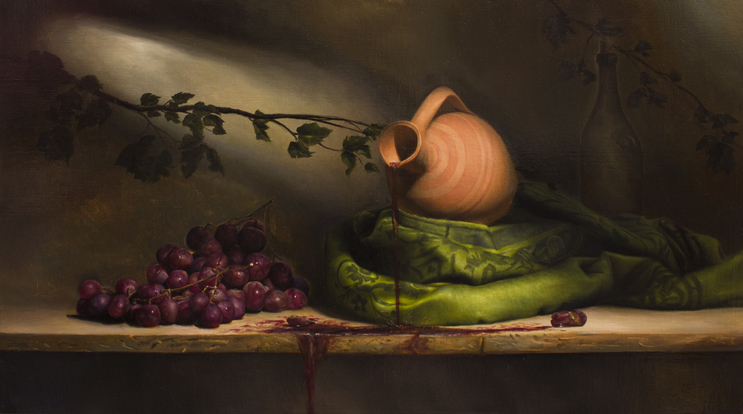 A extensive compilation of extremely exquisite and technically superior Still Life Paintings made by David Shepherd. Realism landscapes with a com-positional emphasis on extremely dynamic skies and rural foregrounds. Contemporary Realism, Surrealism, Syncretism and more. An eclectic mix of styles centered around Realism. David Shepherd is a Realist/Hyper Realist Artist who paints exclusively in oil on canvas. Born in Canada, David showed an interested in the visual arts starting at the age of 3. As a teenager he would continue to increase his skill by copying comic books in his spare time. During high school he was introduced to paintings by Rembrandt and Salvador Dali and was enamored with the idea of creating something as beautiful and meaningful for his career. He was first exhibited at the Art Gallery of Hamilton at the age of 19 (A gallery that includes a multi million dollar collection of 16th - 21st Century Masters) and he was educated at the Academy of Realist Art in Toronto from 2008 - 2012. The school’s curriculum is based on the 19th Century French Academic system made famous by William Bouguereau. The internationally acclaimed artist John Michael Angel started the school during the 1990’s Resurrection of Realism and the academy continues to be the only school in Canada that has kept the excellent standards established during the period of high Realism in 20th Century Europe. After the Academy of Realist Art David has gone on to show his work around Canada and in the U.S, and continues to strive to improve not only his technique but his composition and the ideas behind his paintings. He has a life long dream of one day producing a very large interior mural that will combine the many different styles of paintings produced over the years into one theme. He is married, with two sons, and works out of his house studio in his hometown of Hamilton, Ontario. In his private life he is a believer in Taoist philosophies and is a practitioner in health and wellness including swimming, basketball, resistance training, yoga, meditation and diet. He also has a great curiosity with science, specifically the subject of Physics. David’s body of work is eclectic with a foundation of realism, ranging from traditional Still Life, Landscape, and Portraiture to combining Realism with Cubism, Soft Cubism, Impressionism, Expressionism and Abstract. Currently he is represented by galleries in the U.S and Canada including Le Soleil Fine Art in Vancouver. Le Soleil Fine Art includes a 90 million dollar collection and David’s Shepherds paintings are shown alongside historically infamous old master such as Picasso, Van Gogh, Rembrandt, Renoir and more. Mr.Shepherd has also been displayed in notable shows across the U.S including the Oil Painters of America National show in his first year with that group. He participates yearly in the Artist Project at The Exhibition Place in Toronto and is an award winning member of the Portrait Society of America, Oil Painters of America and the National Oil and Acrylic Society. For enjoyment he also participates in the Artist Battle Competitions and has made the Ontario Finals. Working alongside clients for private sales and commission work, his work is on display in private collections in Canada, U.S and Germany. I often hear from clients they are nervous at first to contact an artist, please do not be put off. When you message me using the form below it will go to my email and I will personally contact you back. Don't be shy! Thank you, I will respond back to you within a few days.